A set of wickedly funny shortÂ stories for children. Welcome to the wonderful world of Ballyyahoo. Ballyyahoo is a magic place hidden away in a secret place on Irelandâ€™s Wild Atlantic Way. Nobody knows where Ballyyahoo is - except the people who live there, but they must keep it secret. Maggie Many Cats knows how to keep a secret, but when a strange black cat comes flying in the window she thinks sheâ€™s going mad. 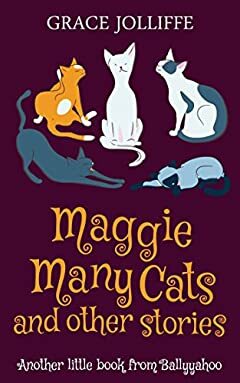 Cat-loving Maggie is desperate to know the truth. Is she imaginingÂ this beautiful talking cat? Sheâ€™s terrified of being put in a home - who would look after her many cats? Maggie bumps into Biddy, who she suspects might be a witch. Soon Maggie learns thatÂ thereâ€™s lots more secrets hidden in the depths of Ballyyahoo. Meanwhile, Gerry Mac is bored, all he ever does is swingÂ on a gate, until heâ€™s sent to work in Paddy Plantâ€™s slave camp. All day long he must dig, dig and dig. How can he ever escape? His cousin, Kevin, is always in trouble - he wants adventure and he wants fun but he canâ€™t resist a prank. But one of his pranks backfiresÂ and theÂ long-suffering people of Ballyyahoo have had enough. Will Kevin ever be free again? Then thereâ€™s Sergeant Sid. Heâ€™s so bored he makes up laws and these change every day. Gerry is supposed to be walking Daffo, Paddy Plantâ€™s mad donkey, but it all goes wrong when Daffo breaks free. They break one of Sergeant Sidâ€™s many lawsÂ and they both end up in jail. Everybody knows that when a donkeyâ€™s got to go - a donkeyâ€™s got to go, but when Sergeant Sid gets splattered itâ€™s Gerry that gets theÂ blame. Can Gerry dig himself out of this one? When you own a Ballyyahoo book you get to visit the wonderful world of Ballyyahoo - just by clicking the links in the eBook. The site is packed with free stories, photographs, background information about the characters, animals, nature, and of course, the magic of Ballyyahoo. Grace Jolliffeâ€™sÂ first novel, Piggy Monk Square, was shortlisted for the Commonwealth New Writers Prize and broadcast on RTE's Book on One. Grace is not quite the full hermit, but she does live quietly in Galway, surrounded by rocks, stones and roads to nowhere. In the past, GraceÂ taught scriptwriting and creative writing to keep her in teabags and light. Grace loves nature and walking but the accidentÂ kept her indoors for quite some time. She blames cabin fever for the creation of her imaginary town of Ballyyahoo. She is happy in her current position as head of imagination at www.ballyyahoo.com and is responsible forÂ creatingÂ stories that combine magic and nature. She aims to entice children to leaveÂ their screens, put on some wellies and get outdoors. Grace can be found at www.gracejolliffe.com where she writes about rocks, stones and roads to nowhere, as well asÂ this funny old world as she sees it..